Nothing about Brent Stockwell says “radical.” He is soft-spoken, fastidious, polite, precisely tailored, and stacks water bottles in his office so neatly you’d think he used a ruler to place them. But Dr. Stockwell, associate professor of biological science and chemistry at Columbia University, has bet his entire career on a hail Mary: the idea that chemotherapy is a lousy approach to cancer treatment, and that we’d be better off treating cancer like any other disease, by finding drugs that interact with the diseased cells themselves. Of course, doing so means contradicting 30 years of conventional wisdom. 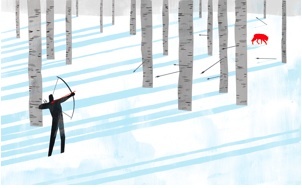 My first piece for Columbia Magazine, The Long Shot.